The Favorites Library has evolved into a much more powerful tool! Save time by saving components as favorites! Once you're done tweaking the component settings to fit your project's specific requirements, and you've applied materials to the sub-components within, you can then save it as a favorite for later use. Filter through your Favorites library and pull in the components you need. In the Favorites Library, right click on a component for additional options. 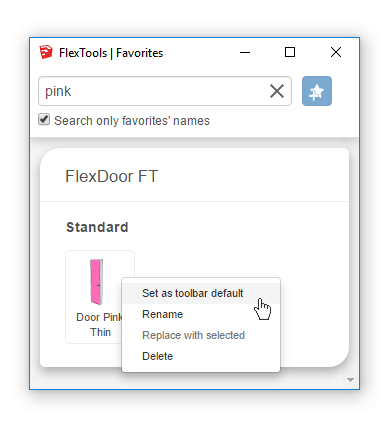 'Set as toolbar default' sets the component as the default component that will be pulled in when pressing on the corresponding toolbar button.